L'Ortolan Pastry Chef Charlotte Duncan's latest creation is a delicious caramel mousse, salted caramel & toasted hazelnut with praline ice cream for our A la Carte menu. After we posted a photo of the dessert on our Facebook page and Twitter feed one or two followers requested the recipe for the honeycomb. So here it is for you to try, Charlotte's recipe for honeycomb, but be careful as it can be quite lively. 2. Add sieved bicarbonate of soda taking the pan off the heat and mix with a whisk - take care with the hot mixture when whisking! Disclaimer: Please note that this recipe requires unlimited supervision at all times. We do not accept responsibility for any injuries incurred while making your honeycomb. 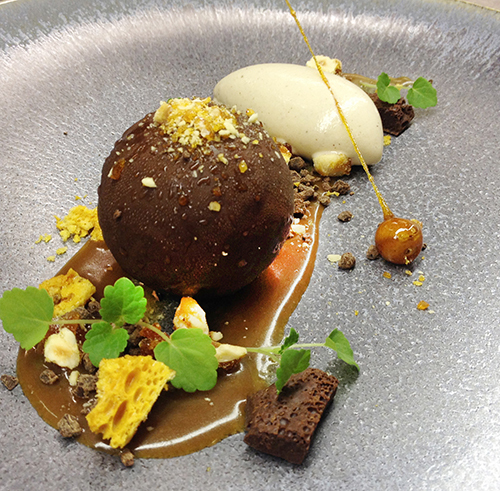 Charlotte's dessert is now available for lunch or dinner on our A la Carte Menu.